I've recently got a random urge to do another Bleach pencil drawing. 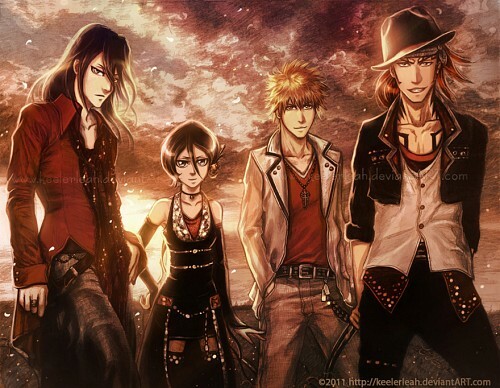 I came across a photo of the band The Gazette on my computer and the idea for this just hit me (and yes, both Byakuya and Renji's clothes and poses are referenced directly from the pic I found). The clouds were also referenced from some photos I took. I have always found drawing clouds in pencil difficult, so I didn't know if I could get them realistic or not... but I guess they turned out alright. Drawn completely in regular pencil (on 8.5x11 computer paper) then scanned and darkened. I then added in some color with photoshop under the pencil. Some effects were also added above the pencil. Time: Pencil: approx. 3 days in my spare time, Coloring: 6 hours. Drawn with a regular mechanical pencil. Do not re-post, resubmit or edit this picture. You Can't use the pictures for layouts, blogs, websites, myspace, banners, designs, posters, cd, books etc without accessing a written permission from me. Considering the high caliber of her artwork, drowranger's recent leap into the MT indy art gallery is a well appreciated one. What amazes us about this artwork is clear to see: it's wonderfully detailed (the tiniest details in the textures in their clothing and sky gives this a bigger 'wow!' factor), it's skillfully colored (the lighting from the sunset is pulled off excellently), and it has a memorable execution of Bleach's most notable characters - Wild West style. 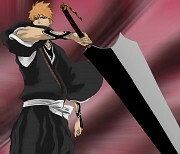 This is one Bleach artwork that you shouldn't miss. Great work drowranger, we can't wait to see more of your artwork in the MT galleries! Proposed by SolemnSerpent and highlighted by fireflywishes. Great work once again! You got skills, thanks for sharing them with us. The colors look good. I like the details, but the image itself is so small. It would've been nice to see it larger (and without all of the watermarks all over it). Something kind of looks off with some of the anatomy though...I think Renji's head looks a little too big? Anyways it's overall pretty nice. Please do share your stuff more often here! oh don't expected if you idea comes from the GazettE, are you their fans? o cool i didn't know you posted your work on here!